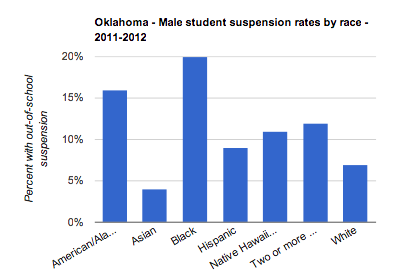 Oklahoma is one of 12 states in the nation that suspended both female and male black students at a higher rate than their white peers, according to a U.S. Department of Education report. According to the data released Friday, about 20 percent of black male students received an out-of-school suspension in 2011-2012, compared with 7 percent of white male students. For females, 13 percent of black students had an out of school suspension in 2011-2012 compared with 3 percent of white students. Other states also suspending male and female black students at higher rates than white students are: Alabama, Arkansas, the District of Columbia, Indiana, Michigan, Missouri, Nebraska, Ohio, Pennsylvania, Tennessee and Wisconsin. findings indicate students of color are disproportionately affected by suspensions and zero-tolerance policies. The report also includes district and school-by-school breakdowns for each state. Students who are suspended are less likely to graduate and are more likely to repeat a grade, become suspended again, become involved in the juvenile justice system or repeat a grade, according to the U.S. Department of Education. U.S. Secretary of Education Arney Duncan said the results show the United States still has work to do to provide equal opportunities to all students. “This data collection shines a clear, unbiased light on places that are delivering on the promise of an equal education for every child and places where the largest gaps remain,” Duncan said in a written statement.